The Life and Art of Ina D.D. Uhthoff, by Christina Johnson-Dean, Mother Tongue Publishing Ltd., Salt Spring Island, 2012. Emily Carr had a visitor to her studio in Victoria sometime in the late 1920s. “She is an artist with two children and an invalid husband to support,” Carr wrote in her journal without naming her. “I esteemed her very much.” That artist was most likely Ina D.D. Uhthoff ( 1889-1971), a Scottish emigree and prominent artist and educator. Today, a collection of Uhthoff’s varied and stunning art work is safely housed in British Columbia and Alberta galleries, but her life and work has not received the greater recognition it deserves. The fifth in a series of ‘unheralded artists of BC,’ written by Victoria-based Christina Johnson-Dean, this is a remarkable story of a determined and talented woman, born Jemima (“Ina”) Duncan Dewar Campbell, in a district close to Glasgow. “Ina” was the fifth child in a prosperous family. She first came to BC to visit friends in the Kootenays in 1913. Returning to Glasgow, she continued to study art and became certified as a teacher. Following the First World War, Ina married returning soldier Edward Joseph Uhthoff. The newlyweds immigrated to Crawford Bay in the Kootenays to farm and soon had two children, John and Muriel. But early on the marriage was unravelling, as the author sensitively recounts, and Ina eventually re-located to Victoria with her two young children. Likely Edward’s war wounds had incapacitated him, the author believes. He did not re-marry (nor did Ina) and quietly lived out his life, to age 85, apart from his family. By the fall of 1925, Ina and her children were settled in Victoria. Ina had “established herself as a busy and hardworking young teacher, artist and community member.” From this point forward, she built a remarkable career, making significant contributions as an art educator and artist. Former students recall Uhthoff was of tough Scots stock, giving praise only when due, but committed to her students and hardworking to the core. Ina sketched her son with a mother’s pride, “John Uhthoff as Pilot” as well as acknowledging women’s war work in a compelling oil in shades of blue, “Girl Welder at Work.” Her subjects also included landscapes she loved in the Kootenays and on Vancouver Island. Uhthoff played with geometric shapes giving a modern feel to her works, though she challenged post-war trends in her art columns for the Victoria Daily Colonist newspaper. Uhthoff was accomplished in several other mediums as the book’s color-plated illustrations attest, including watercolors, etchings, linocuts, pastels and pottery. Unlike some artists, Uhthoff didn’t seem to obsess on a certain theme or style, though her experiences as an artist accumulated over the years to great results. “Suburbia”, a mixed media art work, for example, is a beautifully layered image of a mass of residential rooftops, with a distant sea beyond and a few stark trees towering in the foreground. 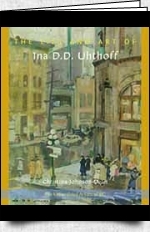 “Her work was considered an inspiration,” the author observes, “and an example of a top-flight artist in Victoria.” Perhaps the diverse nature of Uhthoff’s works is partly the result of the many pulls on her time, with paid work a necessity and two children to raise, esentially alone—both tasks done with her full attention and care. As with previous books in the series, several artworks and biographic photographs enhance the text. Johnston-Dean left no stone unturned in tracing Uhthoff’s story, interviewing family members and others who knew her. The second in the series to feature a BC woman artist, readers not only gain a valuable regional history, but also another perspective on women’s lives—and their creative gifts for future generations to appreciate.